Tangier, referred to as “The Bride of the North” has long been a romantic haven frequented by artists, beat poets and writers who arrived on North African shores from the 1920’s - 1960’s seeking an exotic adventure in this “international zone.” Tangier’s allure during the 20th Century was its liberal lifestyle that allowed people to reinvent themselves. Tangier intern became a seductress: whereby booze, drugs and parties ruled during the free zone period. Notable visitors who came to this Moroccan enclave include Paul Bowles, Matisse, Malcolm Forbes, Pierre Loti, Van Dongen, Paul Morand, William Burroughs, Delacroix, and Van Dongen. Tangier was a place where people could rub shoulders with Truman Capote, Tennessee Williams and Gertrude Stein. Although the Sultan of Morocco continued to have sovereignty over Tangier and the Moroccan people, the city developed a reputation famous for being a melting pot. Over a 32 year period, it became a city tolerant of all cultures, religions and lifestyles. Tangier continued to attract a host of prominent Europeans and American artists, writers, musicians, poets, billionaires, filmmakers and celebrities, all who produced art in its honor. 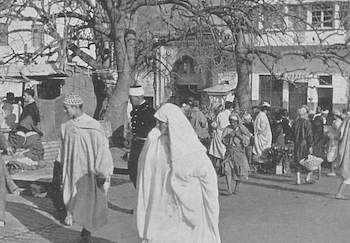 In 1956, the city became part of the newly independent Kingdom of Morocco. Surrounded by the Rif mountains and a Mediterranean Coast Tangier sits at the northern tip of Africa and is just 40 minutes by ferry from Tarifa, Spain. The new, modern city boasts a bustling port that has become a hub for International trade. 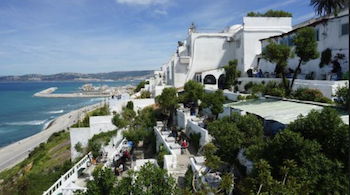 Some of the world’s largest cruise ships dock here yet offer travelers only 24 Hours in Tangier. 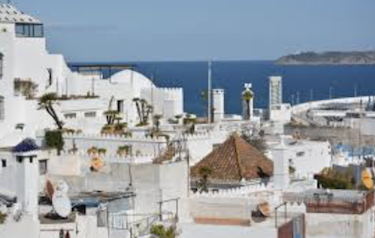 The Tangier of 2019 has a cleaned-up image and is part of the Regional Council of Tourism (RCT) Tangier- Tetuoan-Al Hoceima project. RCT's aim is to keep the region clean, modernize the city and encourage a new age of tourism. There is a variety of natural environments surrounding Tangier which make it an ideal place for hiking, fishing, and water sports. What remains, is the essence of Tangier in keeping with its past, as a culture and literary hub of Morocco. Tangier continues to inspire gallery openings and young designers come to start fashion lines, boutiques and concept stores. The city's vibrant art scene also encourages filmmakers with its annual International Film Festival and musicians with the Tan Jazz Festival that takes place each September. The Tangier of today is safe and easy to visit. At King Mohammed VI’s request tourists are not permitted to be pestered. This makes walking aroundTangier’s old city “The Kasbahs,” monuments, museums and boutiques, all the more enjoyable. 8:00 AM - 10:00 AM: Morning Stroll along Boulevard Mohammed VI Rise early and go for a stroll or jog along Boulevard Mohammed VI. From the Corniche Gardens, you can take in a wide view of the port and a magnificent view of the ancient city walls. ; across from lookout point at Muraille de Tanger. Mohammed VI Boulevard is lined with Moroccan cafes that offer views of the Atlantic Coast’s turquoise blue waters. New on the block is the Tanja Marina Bay, a long strip perched with cafes and restaurants built near the port area. The French Cafe Paul and La Table du Marche are two options for breakfast perfect spots if you want something modern. If you prefer the tradition of a long-standing Tangier breakfast visit Cafe de Paris, once frequented by Paul Bowles, Jack Kerouac, William S. Burroughs, Allen Ginsberg, and Tennessee Williams. Other local options are Le Salon Bleu or Le Nebab located in the Kasbah. 10:00 AM: Soak Up Literature At Librairie des Colonnes Morning inspiration can be found at the famous landmark bookshop Librairie des Colonnes with wonderful architecture. Librairie des Colonnes is a Tangier institution that offers a wide selection of books, with a healthy English language section. There are book readings, events and author signings that take place here weekly. Once a favorite stomping ground of the legendary Paul Bowles, Jean Genet, Samuel Becket, and William Burroughs, this one-of-a-kind bookshop should be on your bucket list. 12:00 PM: The Grand Socco & Cinema Rif Not far from the American Legion Museum is the Grand Socco, a souq and the official entrance to the medina. The Grand Socco is filled with interesting historical mentions. It was once the home to the Mendoub, a representative of the Sultan. At the top of the Grand Socco lies the Art Deco Cinema Rif Theatre which offers two main screens and plays mainstream and indie films with subtitles. Today the Cinema Rif also serves as a cultural center attracting students, writers, and curious travelers with its free WIFI, hot beverages, and art house coffee talk. On Thursdays and Sundays, the Grand Socco is also the spot to find the farmer’s market. Djebelli villagers come into the city from surrounding regions and bring fresh goat cheeses, organic fruits, vegetables, and farm fresh eggs. 2:00 PM: Explore & Shop the Ancient Medina - The Kasbah An essential part of any trip to Morocco is getting lost in the walled cities (historic medinas). 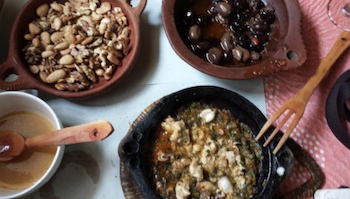 The 14th-century medina in Tangier is a cornucopia of traditions self-contained by its 15th Century Portuguese walls. Its labyrinth of alleys run the entire city, each offering a glimpse of local life. Rue Sebou and Rue des Almohades are a shopper’s paradise for those interested in purchasing traditional Moroccan goods. They are filled with stalls selling artisanal goods such as leather, caftans, baboosh, silver teapots and glasses and sweets. To shop for modern goods, visit the streets around the Kasbah. Design Concept stores such as La Chicas and Rumi 1436 offer a new take on Moorish Design. Las Chicas showcases Modern Moroccan fashion and decor offering a keen mix of cushions, lanterns infused Moroccan oil and tasseled goods. Rumi 1436 specializes in natural candles made with organic soy wax and Moroccan tea sets composed of silver and glassware. For handmade luxury goods visit Laure Welfling’s Boho inspired boutique where you can find embroidered caftans, hand stitched and sequined overcoats. Their line of ready-to-wear for men and women has been created using a mixture of fabrics and styles with a luxurious and sophisticated fashion approach. Every year a collection of unique pieces, entirely handmade, is designed between Paris and Tangier. Not to be missed for those looking to shop for a Berber carpet is Coin de L’Art Berber, which offers an extensive collection of rugs including those from the Middle and High Atlas regions, made by Saharan and southern Berber tribes. There is also a collection of doors, locks, windows, and boxes from southern Morocco and the Sahara. 4:00 PM: Tea Time at Cafe Hafa At 4:00pm, make your way over to Cafe Hafa. 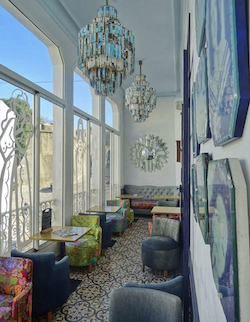 It’s tea time at this multi-leveled blue walled cafe, where the best views of the Bay of Tangier can be found. Sip your Mint tea with camera in hand. Opened in 1921 Cafe Hafa retained its 1920’s style exterior decor. Beat Generation writers like Paul Bowles, William Burroughs and musicians like the Beatles and Rolling Stones frequented Cafe Hafa famous for serving Moroccan mint tea. It’s also the perfect place to light up and enjoy kif overlooking the Mediterranean Sea. Today, Cafe Hafa is still popular with celebrities. 5:00 PM: Visit the Kasbah Museum Next visit the Kasbah Museum. Formerly known as the Sultan's Royal Palace of Dar El Makhzen, the Kasbah Museum focuses on the history of how Tangier is linked with Europe. It also displays archaeological artifacts from the Northern Morocco region. The permanent exhibition is divided into three parts, the seigneurial residence with garden and outbuildings (al-dar al-kabira), the first-floor apartment (dwirat qubbat sidi-al-bukhari) and the ceremonial room known as the treasure room (bit al-mal). Architectural characteristics of the residence include a large courtyard paved with zellij (small tiles), a water fountain, portico columns decorated with crescent moons, and zellij panels in the North and South wings. There are also two main rooms with trademark muqarnas (honeycomb-work) featured inside an ornate wooden dome with repetitive epigraphic and geometric motifs. 6:30 PM: Wind Down at Les Fils du Détroit After a long day of exploration rest your feet at the 15m square musical home of Les Fils du Détroit. The group is now managed by a local architect however has been rocking the Kasbah for over four decades. The native Moroccan men don’t ask for an entrance fee, rather they serve you mint tea and hold live jam sessions out of sheer pleasure. Listeners are in awe of how a violin, a Middle Eastern oud (borrowed from Andalusian music in Morocco,) and a darbouka, a single head drum, can blend together so well. 8:00 PM: Dinner at The Morocco Club Set at the top of the Kasbah, The Morocco Club is a historic house turned restaurant and piano bar. It was built by Stuart Church and designed by Vincent Coppe and Oscar Badjii. All three men loved Tangier and left an artistic impact on the city. The restaurant, with its sophisticated charm and decor, looks like a scene you might find in the American series, Mad Men. The upstairs Piano Bar has served its international menu to talented artists like Jazz4Joy, Camélia Jordana, Donia Berriri and L-initiale trio; after dinner head downstairs to the cocktail bar and enjoy live music; the DJ plays into the late-night hours.